So, you've tried Cup Noodles. But what else is out there? I gotta say that Cup Noodles is great and all (especially if it's upgraded), but I can’t imagine only living off this instant ramen with boring chicken broth. Coming from a Korean household that eats instant ramen (aka ramyun) on a weekly basis, I’ve had my fair share of noodle-filled experiences that are probably much different from those that you’ve had. I've noticed that most of the people around me picture ramen in only two ways: Cup Noodles and the authentic and ~classy~ Japanese ramen you see on Instagram. This right here, is middle ground. They’re perfect for those times when you’re feeling all inspired to do something in the kitchen, but you’re too lazy to actually cook. (But hey, boiling water counts, right?) 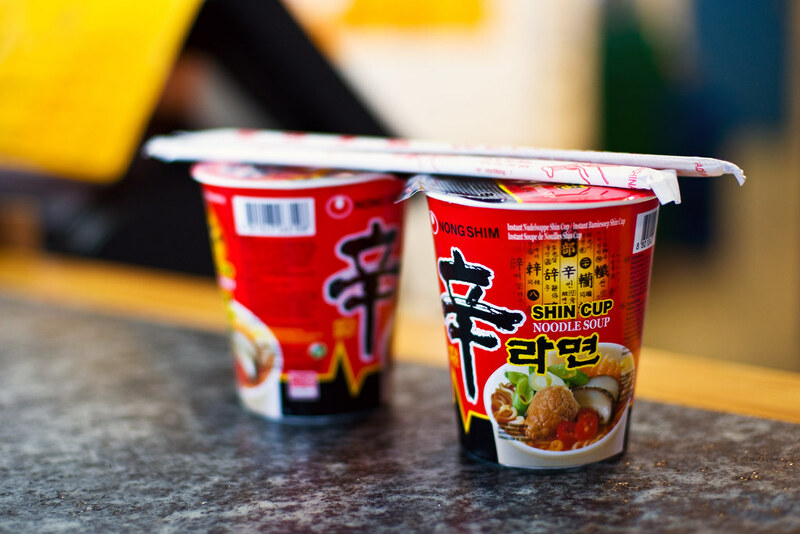 For when you hit that Asian aisle in the grocery store, here are the 7 most interesting flavors of instant ramen to look for. A classic, bold choice for those who have a moderate tolerance for spicy food. On their website, this ramen is said to be cooked with beef, mushrooms, and carrots, which I'm not 100% convinced by. But there is one thing I know for sure, it's hella good in a burn-down-your-throat-as-you-swallow kind of way. See that word at the end? Yup, it makes all the difference in the world between this and the regular Shin Ramyun. This has a much more thick, meaty broth, so the flavors are deeper and get more of that *ahhhh* reaction, while having the kick of the original kind. Ironically, Shin Ramyun Black itself is much paler and whiter than the original. This is pretty much the quickest bone broth you'll ever make. It's perfect in every way, warming up your body with its peppery beef broth. Of course, it won't taste as deep as a broth that has been cooked for hours and hours, but it's pretty a-okay considering that you cooked it for 3 minutes, possibly in the microwave. At first glance, it's not too intimidating, but stop right there! Unless you have the tolerance level of those crazy people who post videos of eating peppers, watch yourself. To be honest, this broth-less ramen is so spicy that I literally can't taste anything beyond spiciness. If you're gonna give it a go, do it because why the hell not. Just remember to keep a nice and trusty gallon of milk and a full box of tissues right next to you. You might be weirded out by its color, but this broth-less ramen packs a lot of flavor with Chinese black soy bean sauce. It's a It's savory, satisfying, and great for those who can't or don't eat spicy food. But unless you have the determination to dice them up and throw them in your ramen, no peas, carrots, and onions for you. Me too girl, me too. You gotta cop that layer of ramen just to protect your fragile things, right? These noodles are special. They're like a fusion of fettuccine and ramen noodles with a throat-tingling spicy broth that's bound to make you cough at least a few times. Warning: They're the hottest of the hot right now, so you may or may not crawl back and forth every row and not find these magically enticing packages. So there you have it my friends, your ultimate guide to Korean instant ramen. The next time you ever crave some Asian goodness that's not from your local Chinese place, consider stepping out of the box and try these noods.